Can cats get eating disorders? I have a feeling that some websites get mixed up about the subject. In discussing eating disorders we have to discuss psychological problems. The topic is about feline mental health issues (poorly understood, incidentally). We are not referring to eating too much and becoming obese or not eating enough because a cat feels ill. Feeling ill and under eating is not an eating disorder in my opinion. Overeating because a cat is bored is not, in truth, an eating disorder. However, there is one well-known eating disorder among domestic cats which is Pica. A lot of people know about this but the experts aren’t sure about the cause of it. 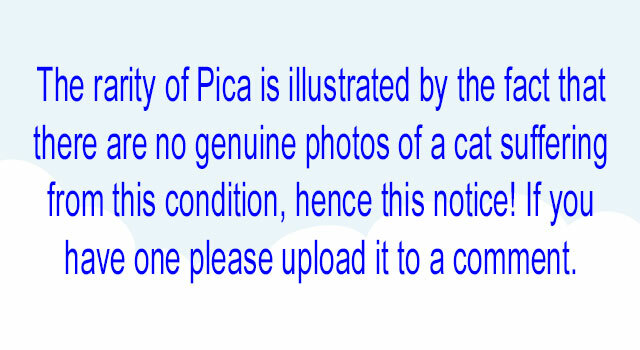 Pica is the eating of non-nutritive substances. Some house cats develop the habit of chewing on items such as wool and elastic bands. Wool sucking is probably not Pica but a result of early weaning. Pedigree Oriental cats, it is said, are predisposed to this eating disorder. The fabric choice is usually wool and sometimes cotton. Synthetic fabrics are not as popular. They start by chewing woollen items and progress to swallowing chunks of fabric. The cats appear to be confusing fabrics with cat food. This is a genuine eating disorder amongst our feline friends (kitten sucking his thumb). It seems that fabric eating is an inherited condition in domestic cats. Sometimes it is accompanied by other types of abnormal behaviour such as biting their owners and excessive scratching. It is speculated that the reason for it is that it is calming for the cat rather like thumbsucking by infant humans. If you look up the phrase “eating disorder” in the best books on domestic cats you won’t find any answers because experts don’t tend to list eating problems within the category of an eating disorder. There are rare situations when a domestic cat who has suffered starvation because of abandonment and then been rescued may eat food compulsively to their detriment because they may be sick afterwards. This could qualify as an eating disorder because the cat has been psychologically affected by a traumatic period of starvation. Under these circumstances the solution is probably to challenge the cat to hunt for food by using puzzle feeders. This would slow the cat down and restrict the speed of eating. Some domestic cats are picky eaters. I remember a colleague (Jo Singer) of mine saying that her Oriental Shorthairs were picky eaters. Once again, I wouldn’t classify this as an eating disorder. It is simply about a cat who has particular tastes and it’s up to the owner to find out what those tastes are. So-called “anorexia” in domestic cats can be a symptom from a large range of feline health problems such as kidney disease, liver disease, pancreatitis, diabetes, oral health, trauma injuries, cancer and gastrointestinal disease. Another cause of undereating is stress. A cat’s desire to eat is affected by an underlying health problem but this is not a mental health problem. It’s worth noting that in humans people don’t really know the cause of anorexia nervosa. But it is certainly a psychological condition. Cornell Feline Health Center refer to the word “anorexia” with respect to feline health. However, Dr McDaniel says that anorexia is not “a disease entity in itself, anorexia is a very broad clinical sign”. Yes, it’s a result of or a symptom of an underlying physical illness. It probably goes without saying that eating grass is not an eating disorder. Many experts have speculated upon the reason. In an article I have argued that it is because grass contains folic acid. This benefits the cat’s health. Why do cats eat grass? Seven reasons, one of which is correct. This entry was posted in eating and tagged cat eating, cat mental health, Pica, pica in cats by Michael Broad. Bookmark the permalink.